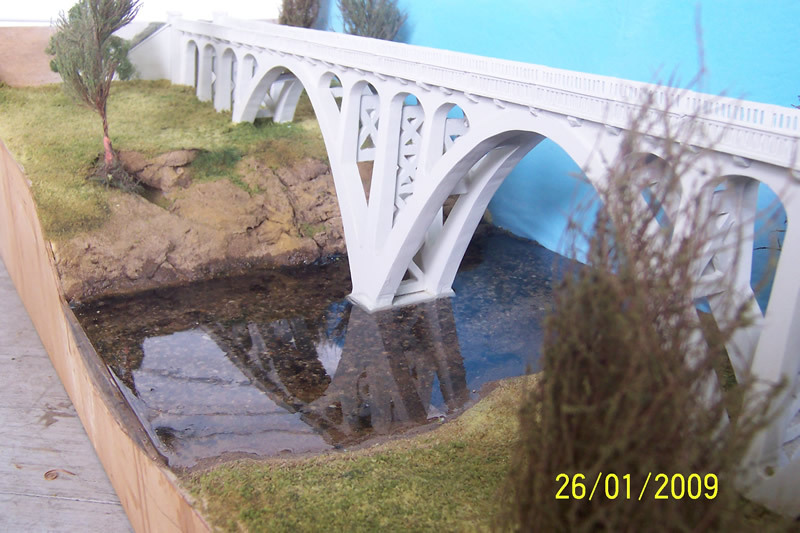 The completed model looking north, before ballasted track was laid. Small stone and sand from Lockyer Creek were used to create the bed which was then covered in a two part clear casting epoxy to represent water. The depth of 2-3 feet is typical of this watercourse. various commercially available material for trees, grass etc. Some of the model trees are of casuarinas (she oak) which are common in this part of the world, they were made from a plant called foxtail sedge, found on low sandy banksia country on the Sunshine Coast. 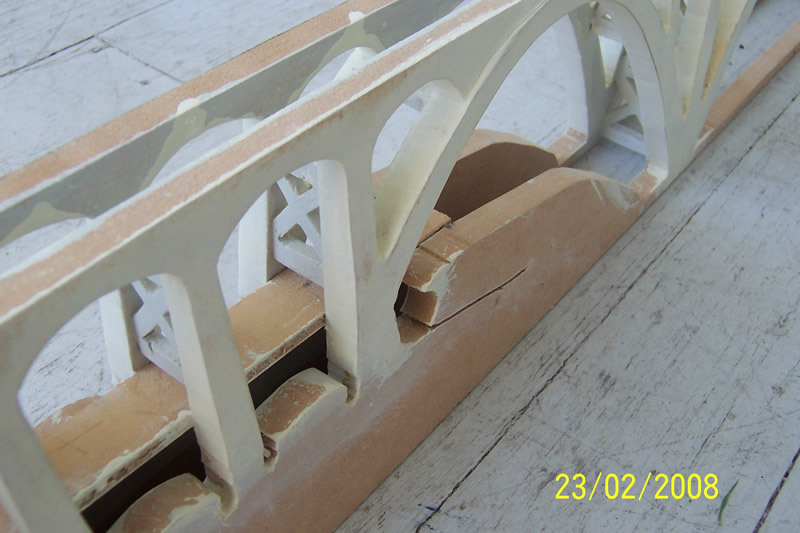 The construction of the model was based on two 4 feet sections of medium density fibreboard (MDF) of 12mm thickness, that were pinned together, and cut to the shape of the arches using a jigsaw. Once cut, they were unpinned and formed the two sides of the bridge, one eastern, and one western. MDF was ideal for some of the carving and shaping required, using a high speed miniature sanding tool. The intervening braced pillars (with the cross) were cut out using a fretsaw. These parts were all glued together before painting with an undercoat. The roadbed was a 4 foot section of 3mm plywood pinned to the top of the structure. 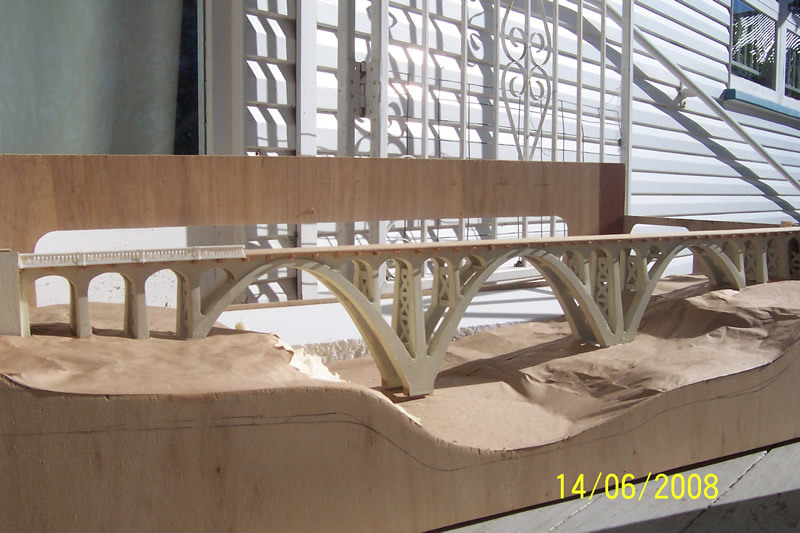 The bridge parapet was a resin casting using a two part rubber mold to reproduce the detail of the balustrade. This had to be cast 44 times to create the length required. This photo shows how the MDF sheets were cut out intact with a base, and with inserts to form the ground level, both of which are eventually covered in scenic material. This picture shows the raw unfinished model set in the module frame with scenic base material, and the first 4 of the parapet castings installed. Brown paper was used over a mix of foam, paper and cardboard. The end abutments are done in balsa wood and plastic. Previous model bridge picture Next model bridge picture.